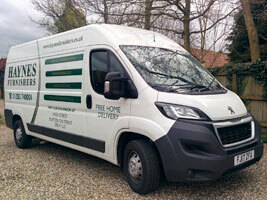 All deliveries are made with our own vehicles, as shown. 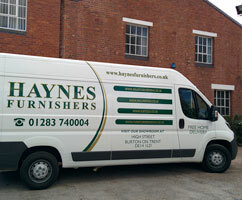 Our vans are large enough for most orders of furniture, but small enough to negotiate tight access and rural areas. On delivery the furniture will be brought into a room of your choice and our delivery team will remove all packaging for you. You will be given ample time to inspect and approve the furniture. Please do ensure that walkways are clear and that there is space in the room for your new furniture. Once the new furniture has been delivered we will ask for the balance of the order to be paid. This can be with cash, cheque or a debit card (credit card balance payment must be agreed at the time of placing the order). For a card payment we will phone this back through to our office for clearance. Please note that delivery is free across mainland England & Wales and Scottish postcodes areas of DG, TD, KA, ML, EH, G, KY, FK & PA1 through to PA19. For all other Scottish postcodes, please call us on 01283 740004 or email [email protected] to discuss. Other areas of England & Wales which are off the mainland we may have to apply a delivery charge.